Offering you a complete choice of products which include thyristor switching modules and thyristor module. 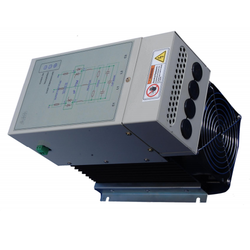 Maximum Current 100 A (50kVAr), 50 A (25kVAr) and 20A (10kVAr) non continuous, since thermal load is important. ABB's pF-TSM is a Thyristor Switch specifically designed for high speed switching of Power Factor Correction Capacitor Banks. (10kVAr, 25kVAr & 50kVAr @ 415/ 440VAC, 50Hz). Triggering of Thyristor Switch is done by Power Factor Controller meant for such applications viz., ABB-RVT-D / ABB-PFR-T12 etc. having a Transistor Output for the said purpose. It can also be triggered by other means using PLCs & Solid State Relays as well. Thyristor switching module is for high speed Reactive Power Compensation Systems in Low Voltage grids from 415 / 440 V, 50 Hz, using single or multiple components of 50kVAr, 25kVAr & 10kVAr. Suitable for capacitor units with or without detuning reactor. Self Cooled Units with Option of Forced Cooling. Monitoring of Supply Voltage, Input Trigger and Thermal Fault. ABB pf-TSM Datasheet V1, 31st Jul18No external Power required for TSM. Optional cooling FAN runs on external power 230VAC, 50Hz. Robust connections via Copper Bus-bars with safety cover. No Eddy Current Cable Heating. Power Supply connections are made using copper flexible cables appropriately sized, through protective devices (viz. high speed fuses) as mandated. 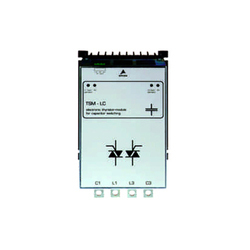 A 12 VDC - 24 VDC trigger signal coming from the Power Factor Controller or other arrangement is to be connected at points “T+ & T-”, for triggering ON the module. It is possible to trigger multiple Thyristor Switch Modules simultaneously to achieve a larger kvar step capacity.